I won’t even tell you how many white t-shirts I go through each year — way too many. The culprit of my dilemma is the Aluminum Zirconium that’s found in most antiperspirants. Aluminum Zirconium stops wetness but it also has a funny way of turning the underarms of a nice white t-shirt into a lovely yellowy shade of…blaggh…yuck. And it doesn’t discriminate. It totally effed up a gray Gucci shirt that I wore ONCE without an undershirt. In this case, the aluminum bleached out the color. Ugggh! Anyhoodle, problem solved! Say hello to Certain Dri Antiperspirant/Deodorant. 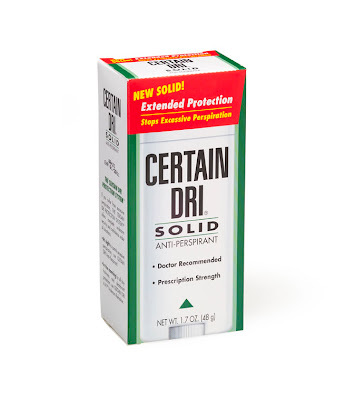 Certain Dri is applied at bedtime giving the formula time to do its stuff over night. I’m no scientist, but whatever it does, it works. In the morning I just freshen it up with a scented deodorant stick from my collection. Lately, my scents of choice are Calvin Klein Euphoria and ck be. It’s funny, I’m not a fan of Calvin Klein fragrances, but Euphoria and ck be smell pretty darn good as underarm deodorants. And yes, the idea of putting on an antiperspirant before bedtime is a strange shift to the routine but so far, so good. For me, the shizzle works! D-R-I.